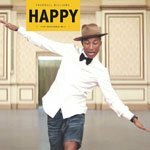 The most obnoxiously exuberant song the radio has heard in a long time would have to be Pharrell’s Happy. Because of the upbeat vibe, it’s a great fit for the ‘ukulele. It’s pretty easy to play. The main requirement for making it work is a solid grasp on a groovy rhythm for the boring parts when you pedal on E7 for the whole verse. You can add a chord riff of E7, A, B, A at the end of every verse line if you like. This makes for a nice change of scenery following the long chord. If you need to learn how to play any of the chords, check out my ‘ukulele chords resource.